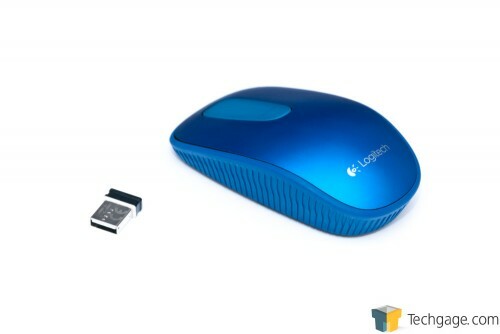 Logitech’s Zone Touch T400 may look weird for the lack of some features you expect in a modern mouse – a scroll wheel, thumb buttons – and it might be easy to dismiss since it doesn’t boast a premium-level price point. 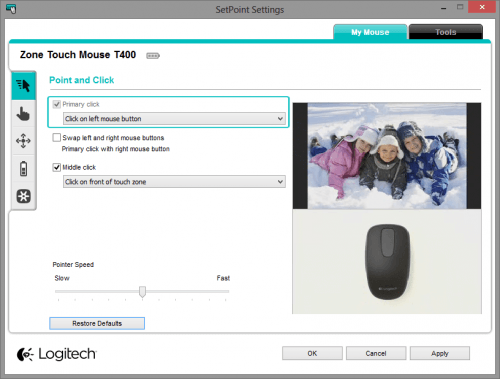 But its revolutionary feature – a touch zone that takes the place of the scroll wheel – just might be right for you. 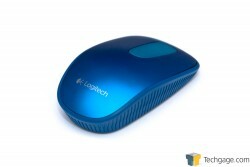 Announced in advance of the summer, Logitech’s Zone Touch T400 is an interesting mouse for a couple of reasons. Let’s start with the color selection: Red Velvet, Midnight Berry, Wild Plum and… Black (it seems Logitech’s creative streak hit a brick wall). For those who might not want a solid color, a white and blue abstract design called Fusion Party is for you. The T400 has been designed with Windows 8 (and RT) in mind, although its special features are also supported in Windows 7. 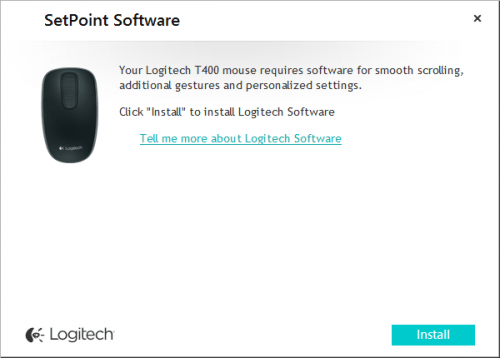 While Logitech doesn’t tout support for Linux with this product, the T400 works just fine there, with the only function lacking being the front click of the touch zone (which in Windows brings up the Start screen or menu). As the product’s name suggests, a touch surface is found in the middle front of the T400, in lieu of a traditional scroll wheel. The sensation of using this touch zone as a wheel is a little strange at first, but after some use, it becomes more natural (though never completely). I can state with assurance that I much prefer an actual scroll wheel, but your opinion may vary. A benefit of the touch zone though is that you’ll be able to scroll left and right just as easy as you can scroll up and down. This is where the Start screen’s use comes into play. It’s common for apps to span quite a distance from left to right, so rather than scroll up or down with your mouse, or navigating with the scroll bar at the bottom, you can swipe left and right with this touch zone instead. Like a typical scroll wheel, this touch zone can be clicked, but the result of doing that might not be what you expect at first. If you click towards the front of this surface, it’ll bring up the Start screen or Start menu. Click the back, and you’ll be brought to your desktop (in effect, Win + D). As we’ll see below, this functionality can be altered. One thing that sets this mouse apart from most is its textured side, which I can best describe as “rippled”. Though it might look like softer rubber, it’s actually more of a harder plastic, but it’s suitable enough and doesn’t became annoying after long use. 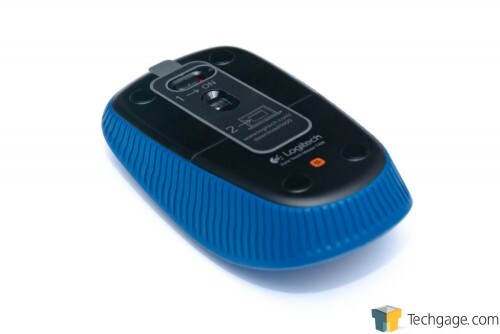 You might also notice the orange logo on the back; this denotes support for Logitech’s Unifying receiver, where a single small USB receiver can manage up to 6 compatible products at once. In the close-up of the touch zone in the photo above, it looks as though it has a textured surface – that’s not the case. Instead, it’s about as smooth as it could possibly get. A smooth surface results in a smooth scrolling experience, as you’d expect. Not pictured, the T400 uses 2x AA batteries for operation, which Logitech predicts will deliver 18 months of battery-life. Although I’ve been using the T400 for a couple of months, I haven’t used it much on my main PC, so I can’t really begin to guess how accurate that prediction is – it does seem reasonable based on my experience with the company’s wireless products in the past, however. After clicking “Install”, the SetPoint software downloads and installs itself. You just can’t get easier than this – there’s no need to hit up the Logitech support, or pop-in a CD-ROM. There are a couple of screens of note in the SetPoint software. First up is “Point and Click”, where you can configure how the touch zone is utilized. If you don’t want to have a shortcut to the Windows Start screen or menu, you can treat the front click of the touch zone as a left click – though that seems a little pointless to me. Arguably, the more useful alternative is to configure the front click of the touch zone to act as a middle click, a feature I rely on since it’s how I open and close tabs in my Web browser. The “Scroll” section of SetPoint tips us off to an interesting feature: the ability to swipe left or right to go back or forward in your Web browser. The neat thing is that the functionality changes as soon as a browser is no longer the active application, allowing you to scroll left to right in a given application. The “Navigate Windows” section also gives an interesting option: “Double-tap on front and rear of touch zone” to zoom in and out. As simple as this mouse is, it really does offer a lot of subtle functionality. 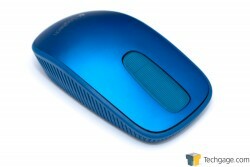 Compared to some Logitech mice we’ve taken a look at, the Zone Touch T400 is without question a simple mouse. 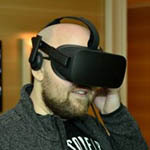 But despite that, it packs in a lot of cool features and functionality. 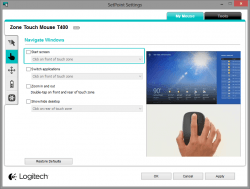 When I first used the mouse, I was worried that Logitech wouldn’t give the option to return the middle click functionality, but it did, all the while adding a couple of more tweaking options I wasn’t expecting. If you don’t like the defaults, you’ll be able to configure the T400 to your liking quite easily. Overall, I liked using the T400 when I did, although it’s a bit too small for my liking. If you have smaller hands, or simply want a mouse for your notebook, the size is perfect – but for the desktop, it leaves a bit to be desired. The lack of thumb buttons will also hurt if you’re used to those, but of course, these are things that are not really needed given the goals of the T400. It’s meant to be a simple mouse. Versus a scroll wheel, I did find it rather difficult to be precise when scrolling up and down with the touch zone. On webpages, it’s generally fine, but when looking through photos or doing anything that requires you to be a little more precise, it becomes a little challenging. This really has nothing to do with Logitech’s design, though; it’s the nature of the beast. I found scrolling from left to right to be even more challenging. In Windows 8 apps, such as news or weather, flicking left and right would always bring me a little bit further than I anticipated. There’s definitely a bit of a learning curve here. 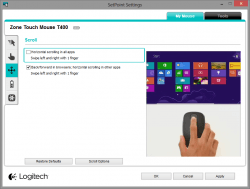 In this particular scenario, I preferred to just scroll up and down with the touch zone, as that’s the default method for going left to right in Windows 8 apps when using a mouse. Again, these are not “issues” with this particular mouse, but instead has to do with the limitations of a touch surface for scrolling purposes. At $40, I’d say the T400 is well-priced. It’s a simpler mouse as mentioned, but it’s reliable, has a long battery life, is comfortable, colorful (if you’re into that sort of thing) and has a fair bit of flexibility. It’s not for you if you don’t like smaller mice, but for those that do, or want a quality notebook mouse, this is a great choice if you don’t mind losing some precision with the lack of a hardware scroll wheel.